Case Study: Automotive — Chris Phillips. The Holden account and it's partner brands have been part of my working landscape since my first job out of uni as a graduate designer. Back then I had the significant task of cutting out and resizing every image for holden.com, a task requiring a deep affinity with photoshop's magic wand tool. A few years later I moved into the full time roll of creative lead on the digital account, responsible for all digital marketing and the buzz word stuff like 'multi-platform' launch campaigns. After leaving Visual Jazz in 2010 to pursue video production, I eventually ended up back on the red lion as the freelance Creative director at Melbourne production agency Hot Glue. The role has covered anything from launch campaigns, directing TV ads and branded content, also encompassing Holden Special Vehicles and the Holden Racing Team. Various HSV shoots I've directed and occasionally edited / colour graded over the last few years. The HSV brand signed a handful of quality ambassadors including Joel Parkinson, Robbie Maddison, Cam Smith and Garth Tander, each with extended social networks capable of reaching a new audience. With this in mind I wrote up a simple proposal for a cinematic video series allowing the audience to find out what 'drives' each ambassador, with subtle nod to the HSV product they drive in on the road. Two more still to come. In 2014, the opportunity came up to direct a Holden TVC around the Anglesea area in Victoria. Was a pleasure to work with DOP Marin Johnson, and Matt Hearn did an incredible producing to ensure we hit everything we needed in one rapid day. In one of the most anticipated shoots of the year, we somehow convinced HSV that it was a good idea to play a prank on one of the toughest rugby players of all time - dressing up V8 Supercar driver Greg Murphy as a bogan driver in disguise. The video has exceeded all exceptions with video views on Facebook and Youtube totalling well over half a million, and the video showing up in the daily news on all the major networks, 'Barry Ford' even had to do some interviews for stations in New Zealand. More coming soon. In 2013, HSV launched a new range of cars called Generation F following the new release of the new Holden Commodore. In my role as Creative Director at the production agency Hot Glue we were commissioned to create a half an hour TV show following the process of the car creation from concept through to production. The final product was broadcast on the Foxtel network, and smaller exerts were published for consumption online. As part of the introduction of the Gen F range, HSV needed a high impact video to be used at the launch event of the car - to be played on a huge widescreen screen in the Crown Palladium Melbourne. The video also doubled as a teaser through social media, getting fans guessing about the details of the car before the full release of specs and photography. In my role as the Creative Director of Hot Glue, we've done a variety of video executions and brand strategy for the Holden Racing Team and their two drivers Garth Tander and James Courtney. The work has varied from simple content productions with the drivers and crew, to broader opportunities like repositioning the brand mantra and concepting physical race day activations to lure new fans. One of my current tasks is preparing a launch video for the 2015 season marking the 25th anniversary of their entry into the V8 supercar scene. Getting back to my design roots - we've started a series of infographics which will give more information about the HSV manufacturing process. The first on is about the leather seats, with more to come on engine specs and the like. Each year the HSV team creates a new video to advertise their HSV Drive day where customers can get behind the wheel of cars with over 400kW of power. Careful where you stand with the camera on these days. A quick set of videos to explain Holden's customer care process and servicing features. It was one hell of a whirlwind 2 day shoot to grab enough footage to shape 7 customer videos. 2012 marked the 25th Anniversary of HSV, and to celebrate we got the brief to make a video celebrating this legacy, which we decided would be work well as a panel discussion show. I directed the panel show and track shoots, before completing a 30min edit which is based on the HSV's brand pillars of distinctive design, innovative technology and exhilarating performance. The show has also been split into 6 segments online for a staged release through social media. I started as a junior designer at Visual Jazz in 2006 fresh out of uni, and I have a lot to thank the place for nurturing me as an inexperienced creative in those early years. 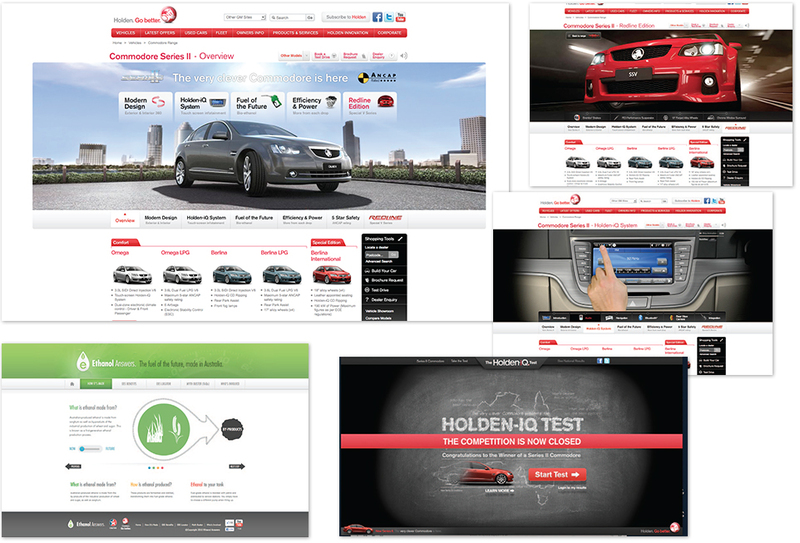 After a while as an interactive designer then art director, I took over as the creative lead on the Holden Digital account in 2009, responsible for pitching and producing all digital campaigns for Holden and occasionally Hummer and Saab too. The campaigns were challenging in their scale - often often involving microsites, banners, search strategies, and social media extensions, it really pushed me to be smarter and more organised with the process of concepting.